Mini cooper convertible-fun and sporty. I like this car because it is small and sporty. The heated leather seats are amazing during the winter and early mornings. It handles very well in the summer months making it a fun car to drive. I have a convertible so it is nice to Cruise with the top down when it is nice outside. It gets amazing gas mileage-I can go for almost two weeks on one tank of gas to work and home. It is very reliable. I have had it for 4 years and with, routine maintenance, it has not broken down on me yet! Now for the issues I have with the car. It is very light so during the rainy season here in the great paw, my car is less fun to drive. Because it is so light it hydroplanes in the heavy rains we get here and freeway driving can feel dangerous. I have not and will never try to drive it in the snow. I have tried to get better tires but this did not make the car less likely to hydroplane. Other than the winter driving worries, this car is fun and sporty and great on gas. I recommend for areas without rain or snow though! The main issue with the mini cooper is the lack of comfort. 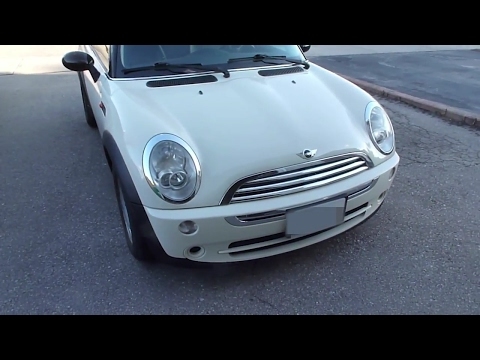 The mini cooper is a great car, though does come with some issues. The main issue is the lack of space in the vehicle, even in the driver's seat. When driving the car, my knees are too close to the wheel and the pedals are too close together, making it uncomfortable to drive. There is simply not enough space in the car fortwo backseat passengers unless they happen to be small children. The fuel gauge is an unconventional design making it difficult to measure how much gas is left. Fun car to drive but everything is mini.. Including the dash buttons. I like the performance of the car. It handles very well. Everything on the dash is too small however. It is difficult to tell what each button does. The front headlight works intermittently and no one can figure out what is wrong with it. The car is comfortable to drive. The heater and air conditioner take a while to work. The heater works best if you are driving on the freeway. The radio is less to be desired. An improperly functioning mat may cause the passenger frontal air bag to be inactive when the seat is occupied, and in the event of a crash, the air bag will not deploy, increasing the passenger's risk of injury. MINI will notify owners, and dealers will replace the front passenger seat occupant detection mat, free of charge. The recall is expected to begin May 1, 2015. Owners may contact MINI customer service at 1-866-825-1525.